In this article, we would like to share with you our development roadmap for the year of 2018. The crypto-world has been experiencing rapid changes on a daily basis. We plan to stay nimble, adapt, and adjust our priorities as needed. Ethereum currently has the largest blockchain ecosystem; we believe this will still be the case in 2018. If Loopring cannot prevail in Ethereum’s ecosystem, it’s less likely to win out in other blockchains’ ecosystems. Loopring on Ethereum remains to be our top priority throughout 2018. The Loopring Protocol v1.0 release supports trading between ERC20 tokens. v1.1 will support incentivizing order managing applications and websites, and v2.0 will support trading between ERC223 tokens, and lastly, v3.0 will support hybrid trading between ERC20 and ERC223 tokens (v2.0 and v3.0's schedule depends on the maturity of ERC223 standard and adoption). We will release multiple versions of our Loopr wallet, and one of them is based on a brand new UX redesign that attempts to greatly enhance the overall user experience. It’s also likely that we will deliver a mobile wallet app with Loopring built in later next year. Here at the Loopring foundation, it is not our intention to beat other developers in terms of implementing a better-performing relay (especially the mining algorithm and sub-system), or more user-friendly Loopring-enabled wallets. Rather, we encourage our partners to come up with their own competitive alternatives of the software whether that solution remains open-sourced or is kept close-sourced. The Loopring protocol doesn’t require implementations of the relay or the wallet to be open-sourced at all. When more of our partners gain competitive advantages and begin making a profit, the Loopring ecosystem will grow and become stronger. 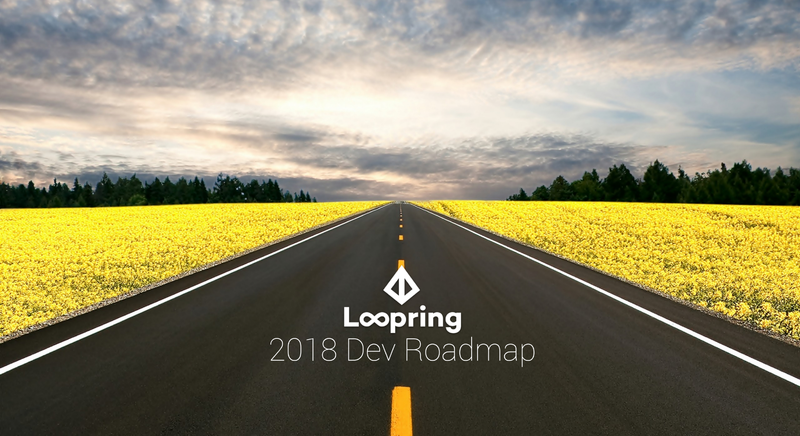 A major responsibility for the Loopring team is to support as many partners as possible throughout 2018. The second step will be to implement proper decentralized governance — LRC holders will be able to vote for or against proposed data changes to the TokenRegistry and TokenTransferDelegate smart contracts. Voting is only meaningful when LRC has been further distributed such that the majority no longer falls under the control of the foundation; otherwise, it will become a pointless formality. As a protocol, Loopring’s strategy is to implement the versions of the protocol across the top public blockchains and distribute new LRx tokens to existing token holders. No matter which blockchain becomes the dominant one, in the long run, Loopring’s token holders won’t be left behind to miss the train. 1. Implement the Loopring protocol on NEO and Qtum. We see the huge potential of both NEO and Qtum. NEO’s NEP-5 and Qtum’s QRC-20 token standards are both similar to the Ethereum ERC20 standard. We believe that implementing the protocol on Qtum should be fairly straightforward as Qtum has a very similar virtual machine to the EVM and already supports solidity. Protocol implementation on NEO should take a bit longer as NEO’s design is quite unique and has a very different set of runtimes and programing languages. The Loopring Foundation will focus on the protocol itself (i.e. smart contracts), with the hope that developers from open-source community and other startups can learn from our protocol, and use our Loopr wallet and relay as an example to allow them to create their own NEO/Qtum wallet and relay implementations. If they such open-source initiatives are taken up, we will consider sponsoring such efforts. Loopring is not a cross-chain token swap protocol per se. Our token on the Ethereum network (LRC) cannot be used by implementations of the protocol on other blockchains. In order to allow the protocol to function cross-chain, we intend to issue new tokens in the format of LRx for blockchain X (LRN on NEO and LRQ on Qtum, for example). We expect that the token issuing and distribution policy will need to be different for each target blockchain. For both NEO and Qtum, we are fairly certain that the majority of LRN/LRQ will be distributed to, Ethereum based, LRC token holders based on a snapshot of each address LRC balance at certain block height, in the future — We will no longer be distributing LRx to the original ICO participants — as we have taken care of all the refund requests as per the demands of China’s regulators, thus distributing tokens to the original ICO participants would be unfair to current LRC holders. A public token sale or auction is also a possibility especially if we have the support of the NEO and/or Qtum core teams. We believe such a token sale or auction to NEO/Qtum token holders will increase Loopring’s awareness and adoption, energize their ecosystems, and most importantly, it will set a base price for the new tokens. Daniel Wang, our founder, is very fascinated by zero-knowledge proof. We will work with research institutes to explore the possibility of integration zero-knowledge proof into our protocol to provide an additional layer of privacy. This is a direction we have yet to begin to, but soon hope to, explore. We intend to work with researchers on possible ways of expanding and improving our relay infrastructure. The current relay utilizes IPFS as a data layer. We would like to assess other options to determine the best choice for our infrastructure. We will be tuning the ring-mining algorithms, to efficiently mine rings of three or more orders. Better mining algorithms can boost liquidity and minimize price spread. We understand how hard it is for new projects to get their tokens listed on major exchanges. We intend to help them by simplifying the registration process for adding their ERC20 tokens to our smart contract. This will allow these projects to have immediate token liquidity from day one. The token should be ERC20 compatible (in terms of public interface and events). The corresponding contract’s source code has to have been verified on etherscan.io and is considered to be safe when being traded using our protocol. We’ve realized that, at our current stage, the token registration decision-making is centralized and subjective; we intend for this to change in the future. We will publish a post describing how to have your token registered later. One thing we will promise you is that having your token registered will always be free. You don’t need to know us, you don’t need to become a friend of ours or a partner of the foundation, there are no special requirements or considerations for registration. We will release loopring.js as a major tool for exchanges and wallets to add support for the Loopring protocol. In the short term, developer documentation will be prepared and published. To support the development of Loopring ecosystem, the Loopring Foundation has decided to set up a Loopring Ecosystem Advancement Fund (LEAF). LEAF will sponsor product development, technical research, and marketing in the Loopring ecosystem. LEAF’s LRC/ETH/BTC tokens will be distributed primarily to teams and individuals who add value to the Loopring Ecosystem as well as the value of LRC token itself. LEAF will be funded with tokens that are currently unlocked and under the control of the Loopring Foundation. We have learned a lot from the development of the Loopring Protocol smart-contracts. We would like to share our experience and lessons learned with the community. We believe there are many talented people out there, much smarter and more knowledgeable than we are, and we are always willing and open to learning from all of you. Please let us know your thoughts by leaving comments/questions below, or send us an email at <foundation@loopring.org>. We’d be happy to improve our roadmap based on community feedback and we will continue to work to the best of our abilities.